As real estate businesses, restaurants, and local service providers will attest, metal A-frame sign printing is a time-tested way of attracting customers. Ever had trouble finding a store, even if it was close by? Metal A-frames let you advertise in the direct line of sight of foot traffic, instead of at an angle or to the side, like other displays. 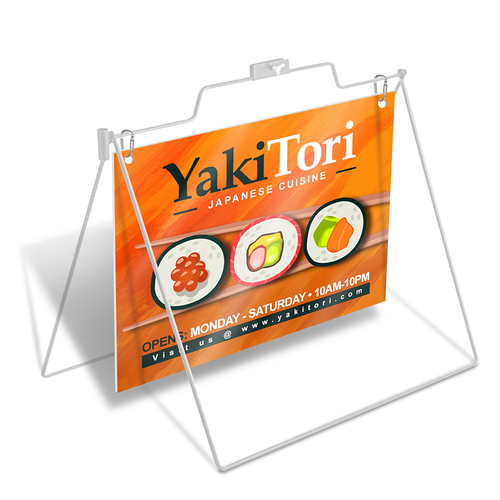 Print metal a-frame signs and help customers find you way before they reach your doorstep. Orders come with a white metal frame and one single-sided or double-sided sign made of 3/16” corrugated plastic. The standard metal A-frame size is 27.75" x 31.5" while graphic size is 24" x 18". Ads on outdoor metal sign frames are easy to swap out, making them a good choice for temporary ads, or for advertising at short notice. This makes them work for situations where you need to take down signs at the end of the day. Metal signs are made from durable lightweight material which are well suited for a sidewalk. You also have a quick turnaround option so you can have your metal a-frame sign printing ready in just 2 business days.